Three of the nine women who have taken actions similar to Vicky Phelan have died since starting proceedings, the Oireachtas Finance Committee has heard. The State Claims Agency came before the committee today to answer questions on how it handled Ms Phelan's case. The 43-year-old was given incorrect test results and is now terminally ill with cervical cancer. Last month, she settled her High Court action against a US laboratory for €2.5m. She was diagnosed with cancer three years after her smear test results of 2011 were incorrectly reported as clear. A review which uncovered the false negative result of Ms Phelan’s smear test was undertaken by the CervicalCheck screening programme in 2014, but this was not communicated to Ms Phelan until 2017. More than 200 other women diagnosed with cancer may have missed out on earlier medical intervention and were not told about the clinical audit. The HSE has said that, to date, hospitals have made contact with 201 of the 209 women or their families. It said that 11,982 calls have been made to the CervicalCheck helpline. 8,150 of these requested a call back. 3,649 calls have been returned to women. Answering questions from Fine Gael Senator Kieran O'Donnell today, SCA Director Ciarán Breen said that Ms Phelan should never have been before the courts. "The SCA did everything in our power to stop that," he said. Mr Breen said that he deplored the fact that Ms Phelan was not told of her incorrect smear test and they had sought at all times for a settlement for her. However, he said experts on both sides acknowledged that the disclosure would not have affected her clinical outcome. What is the Cervical Check controversy about? Cervical Check inquiry - Who is Dr Gabriel Scally? "The only reason that this went to trial was because the US lab could not get sufficient instructions in time." He said that SCA went on record to ensure there would not be a confidentiality clause. Mr Breen said that all of the legal cases he is aware of involve the US laboratory. He said that experts did acknowledge and admit liability in respect of the non-disclosure for Ms Phelan, adding that it was wrong and they said so. Mr Breen explained that in the time leading up to the case, the US laboratory had admitted liability and had offered the State an indemnity, and said they were going to deal with Ms Phelan's settlement. However, the solicitor's firm who was acting on behalf of the US laboratory had some difficulty in getting instructions from their insurance company. "We were at all times pushing towards making sure Vicky Phelan got a settlement and that was always what we wanted to do," he said. The SCA opposed the proposed confidentiality clause in Ms Phelan’s case "all the way" as the agency did not think it was "right or proper." Mr Breen told the committee: "Vicky Phelan quite rightly said that she would not be bound by such a clause." He was responding to Solidarity TD Paul Murphy who said: "one of the most shameful aspects of this case that Vicky Phelan was asked to gag herself." Fianna Fáil’s finance spokesperson Michael McGrath said: "Indemnification is of no comfort to the women who are affected. The people directly affected are left to their own devices to take on an independent laboratory." Mr Breen said there is nothing the SCA can do, under current laws, but maintain its position that the State should not pay out when the State is not responsible. 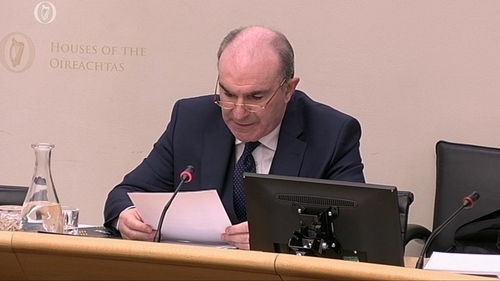 Mr McGrath said it is wrong that women are left to fight an adversarial legal battle with a laboratory and he asked if there is any plan in place to provide redress and compensation to women who were diagnosed with cancer. Mr Breen said that he would not be aware of such a plan. He pointed out that the SCA is quite separate to redress. Earlier, in his opening statement to the committee Mr Breen said Ms Phelan's case is "a tragic case that has had dreadful consequences" and the agency has been acutely aware of the consequences, trauma and pain it caused. He said: "This is clearly a tragic case that has had dreadful consequences for Ms Phelan and her family. "I want to assure the committee that, at every stage of our involvement in this case, we have been acutely aware of the consequences, trauma and pain Ms Phelan and her family have suffered, and continue to suffer." Meanwhile, the husband of a Cork woman who twice received incorrect smear test results, and later died of cervical cancer, has criticised the Government and HSE response to the controversy. Stephen Teap was informed by the HSE in a phone call last Tuesday that his late wife Irene had been given false negative results in 2010 and 2013. She was not diagnosed with cancer until 2016, and died on 26 July 2017. Speaking on RTÉ Radio 1's Ray D'Arcy Show, Mr Teap said that "no-one has control over the situation". Mr Teap said that when he received the HSE phone call last week, it was "essentially goodbye and God bless", with "absolutely no support" offered to him or to Irene's family. In a follow-up meeting last Thursday with his late wife's consultant, he was told the HSE had the audited results of Irene's smear tests on 3 July 2017, but news of the incorrect results was not communicated to the family, with Irene just weeks from death. Mr Teap also criticised this decision, saying it was not the HSE's to make. He said he was only going public with his story so he could tell their sons Oscar, 5, and Noah, 3, in years to come that he had fought for accountability like Irene would have.